Last year, we talked about how collaborators from the Universities of Stanford, Harvard, Sydney and MIT had taken the first step in reproducing the complex human vasculature by bioprinting technology. Well this time around, a new group of scientists from Tsingua University in China and Drexel University in Philadelphia have made progress in a similar scientific path by creating a way to actually 3D print ‘building blocks’ of embryonic stem cells (ESCs). This method is arguably more advanced (and potentially more practical) to earlier breakthroughs that mainly dealt with bioprinting two-dimensional layers of cells. The intrinsic factor in this experiment directly relates to the natural biological condition of ESCs. To that end, in their origin states, the ESCs have a tendency to cluster together into spherical bodies formed of pluripotent cells (derived from blastocyst or embryo). These tiny ball-shaped bodies have the ability to differentiate and ultimately develop into any cell type in the human body. Suffice it to say, the 3D arrangement of the ESCs are pertinent to this end result of differentiation – and that is exactly where this fascinating project comes in. Simply put, the researchers here not only took care of the shape of the spherical embryonic cells, but also successfully managed to control the clustering nature of the cells. In essence, the resultant 3D printing technique allowed the scientists to contrive ‘building blocks’ of stem cells in a uniform and precise manner. This brings us to the contents of the technique used by the researchers, and they entail the combination of ESCs with hydrogel. The composite was then printed as a small grid square with six layers (with 64 cubic mm of volume). This artificially created substance was then cultured and analysed. Over a period, the scientists assessed how the cells morphed into ball-shaped embryoid bodies while remaining static in their grid position. In other words, the cells were found to successfully differentiate while staying in their respective positions – thus resulting in uniform arrangements of the tiny spheres (as opposed to disparate clumps). In practical terms, the researchers found an added advantage of their system, and it related to how 90 percent of the cells (mixed with hydrogel) remained undamaged and completely functional even after going through the ‘rigorous’ 3D printing process. In fact, the embryoid bodies showcased both cell viability and rapid self-renewal capacity for a week, while still effectively maintaining their high pluripotentcy. Our next step is to find out more about how we can vary the size of the embryoid body by changing the printing and structural parameters, and how varying the embryoid body size leads to “manufacture” of different cell types. In the longer term, we’d like to produce controlled heterogeneous embryonic bodies. 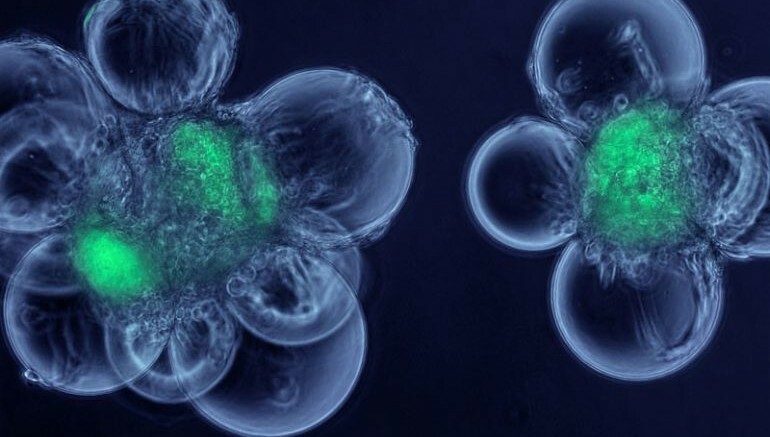 This would promote different cell types developing next to each other – which would lead the way for growing micro-organs from scratch within the lab. The study was originally published in the journal Biofabrication. Botzlab Innovations is committed for Innovations and product Development. Its was carefully formed by group of Experienced Engineers and passionate team. Botzlab Innovations is an emerging Technology R&D Organization , which primarily focuses on Industrial Product Designing, DIY Laboratory Trends , 3D printers, CNC Router and other related emerging Technologies. Based out of Bangalore, the team works on various Projects and 3D printing Solutions. Anytime, if you need any services for 3D printing or product development, dont hesitate to contact us.